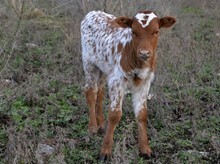 We are very excited about this fancy calf with great conformation and size. Venus is one to watch! Her horns are starting a nice twist, just like both her grand-dam. She is so easy to work - we just point where we want her to go and she cooperates! Venus is one of our favorite heifers from our 2015 calf crop, due to her calm and gentle nature, fancy color, outstanding body, and early twisting horn growth. She had a gorgeous Call of Duty heifer calf in Oct 2017 for her first calf and is a super mama. Tip to Tip 65.5000 11/12/2018 dalgood= 78"